What type of risks does a denervation of the wrist bear? How do I as a patient recognize a wound healing disorder following a denervation of the wrist? Will the scar resulting from a denervation of the wrist remain painful for an extended period of time? Is post-operative hemorrhaging possible after a wrist joint denervation? Could the pain to the wrist return even years after undergoing a successful wrist joint denervation? First of all: No surgery without risk! This of course does also apply to less straining procedures to the soft tissues of the hand, as for example to a denervation of a wrist. At the same time let it be said that the vast majority of patients who underwent this kind of surgery did not experience any complications and in about sixty percent of the cases the desired outcome could be achieved through the intervention. Massive swelling of a hand suffering from CRPS. In rare cases the denervation of a wrist may lead to severe malfunctions of the entire hand, accompanied by swelling and massive decalcifications of the hand bones. In medicine such clinical changes are referred to as CRPS (complex regional pain syndrome). A typical symptom of an advanced CRPS is the patchy decalcification of the hand bones. 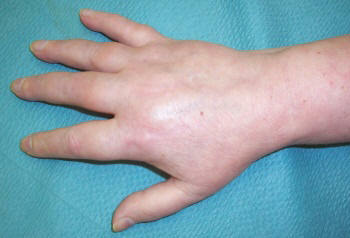 The image shows a complex regional pain syndrome on a hand with severe swelling of the back of the hand. Patients who experience persisting pain during the post-operative aftercare period are at higher risk to contract a complex regional pain syndrome. Many times these patients experience a sensation of tightness as in a too-tight-fitting bandage during this time. Even minor motions or smaller straining activities will cause pain. Over-the-counter pain killers typically only help alleviate the discomfort insufficiently and/or only for a short period of time. Generally a complex regional pain syndrome may pose a risk for any kind of hand surgery or injury! A denervation of the wrist may lead to a worsening of the already compromised mobility of a wrist which is affected by osteoarthritis! Since the cause for CRPS (complex regional pain syndrome) is not known, no doctor can reliably exclude this surgical risk! Wound healing disorders or in rare cases even severe infections of the deep soft tissues close to the wrist cannot be excluded. Such complication would require the administration of antibiotics, possibly even one or more revision surgeries. Quick and immediate action at the first sight of a suspicious reddening in most cases will prevent a fast progress of the infection into the deep soft tissues. Deep infections are fairly rare, but they are very problematic if they do occur. Revision surgeries and permanent mobility malfunctions may be the result thereof. The pain associated with the surgery usually considerably lets up within a few days after the intervention. The mobility of fingers and thumb improves and frequent disturbances of the night rest due to pains within the operated area will more and more vanish. If, however, days into an overall improving condition the pain resurfaces and the mobility of fingers and thumb or even the whole hand deteriorates, it is time to have an experienced hand surgeon, orthopedist or trauma surgeon inspect the wound (Note: The operating doctor is the one who can best evaluate the wound). The possibility of having contracted an infection is particularly high if the wound swells, turns red or produces a new, throbbing pain. Should the suspicion of a deep infection substantiate, the wound requires immediate reopening. A revision surgery should not be procrastinated in a case like this. A denervation procedure which is carried out appropriately should only result in the severance of the pain nerves, not of the sensory nerves. Accidental injuries to the sensory nerves are, however, possible. If the procedure is carried out in a competent hand surgical department, this risk is truly marginal. An accidentally severed sensory nerve will retain an “electrifying” pressure mark close to the scar (referred to as neuroma). In this case the area supplied by the damaged nerve will experience cutaneous numbness. Also, the injury of nerves may be at fault for the development of a very specific pain pattern (CRPS II). Scars associated with the severance of pain nerves – like all other scar tissue on hands – have a tendency to remain sensitive for a longer period of time than for example in other body parts. Keloidal scars in a hand or wrist, however, are rather uncommon. Most scars will have almost entirely vanished within one year. A few months into the healing process the scars appear a little thickened, sensitive and slightly reddish-livid. Yes it is possible and yet again we are looking at a fairly uncommon surgical risk. However, in arteries (for example the radial artery or any larger artery) secondary hemorrhaging is also possible. In case of heavy bleeding a revision surgery becomes unavoidable. Patients taking medicines impacting the blood clotting (e.g. Aspirin®, Plavix®, Clopidogrel®, Marcumar®) are particularly at risk to develop secondary hemorrhaging. Please be sure to inform your anestheliologist as well as your surgeon if you take one of the above mentioned drugs or any other drug that may have an impact on the blood clotting. Yes! Even after experiencing pain-free years the affected wrist joint may start to hurt again. In most cases the progressing of the osteoarthritis is to be blamed. In such situation an affected patient should consider partial or total fusion of the wrist joint. However, prior to committing to such a substantial surgery it may be recommendable to investigate into a naturopathic approach such as a leech therapy first.